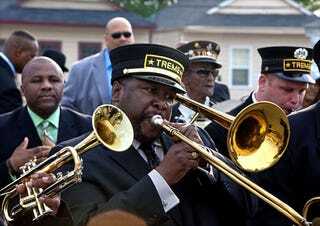 Treme rolled on through another leisurely episode this Sunday. The cross-cutting between characters is no longer as annoying as it was at the beginning, maybe because we've grown to expect it. But there was not much to surprise us in the latest episode. John Goodman's character (Creighton Bernette) continued to suffer from writer's block and moved toward inevitable tragedy; Steve Zahn's character (Davis MacAlary) threw a party; Kim Dickens's character (Janette) catered a party that got rained out. In fact it seemed that everyone was playing music or dancing in this episode — doesn't anybody work in New Orleans? The latest episode took to cutting between loud, raucous scenes of music. It was a reminder of the vitality of New Orleans culture (OK. We get that!) and its diversity. But it also reminded that the culture of New Orleans has been more vibrant in this show than the characters. They all seem to have tragic flaws and be just a little too whiney. Everybody complains but they don't seem to have the gumption to do much about what ails them — maybe except John Goodman's character. In odd ways, the black characters have moved to the background; their whining seems whinier than anybody else's. Khandi Alexander (LaDonna) obesses about her family plot in disrepair; Wendell Pierce (Antoine), plays while babysitting. The chief (Clark Peters) gets closer to appearing in full regalia. Janette, after sleeping again with Davis (why is not clear because he's such a flake), decides she's beaten by the Crescent City and is off to New York. That's a switch; mostly it's when you've made it elsewhere that you go test yourself in De Apple. I'm starting to understand why the music is getting louder: The characters don't have much to say anymore.